In a special report to Gov. 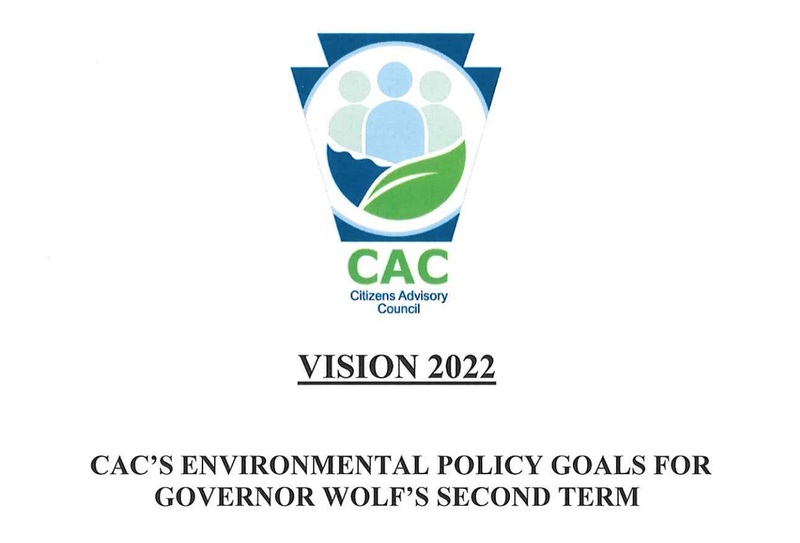 Wolf called Vision 2022, DEP’s Citizens Advisory Council urged the Governor to make rebalancing DEP’s legal mandates and its fiscal resources a priority in his second term. “The budgetary picture is much the same today as it was four years ago. DEP remains strained for funding and lacks the resources to pursue effective environmental planning activities. “While … fee increases will help cover the costs of implementing current programs, increased resources are needed to address coming environmental challenges. “The current agency executives and staff have worked hard at improving the efficiency of the agency, including several e-permitting and other digital initiatives….but it is important to recognize that the legal mandates and fiscal resources of DEP remain unbalanced. -- Consensus Building: The report recommended DEP should increase its efforts to bring people together from all political perspectives and sectors of the Commonwealth to debate, critically analyze and offer solutions to common understandings of specific environmental issues. Pointing to successful consensus building efforts in developing the Phase III Chesapeake Bay Watershed Implementation Plan and the Act 101 Recycling Program Work Group of the Solid Waste Advisory Committee, the CAC said it will work on drafting a document to help the Administration implement the use of these techniques in other areas. -- Professional Development: Noting 28 percent of DEP staff will be eligible to retire over the next 4 years, the report said it was vital to provide training, mentoring and investment in professional development for younger technical and administrative staff to ensure programs operate consistently during the transition. -- Climate Change: The Council said it was encouraged by the recent actions taken by the Governor on climate change, including Gov. 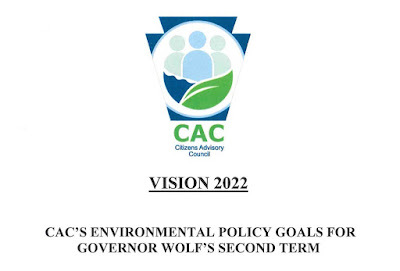 Wolf’s Executive Order establishing greenhouse gas emission reduction targets and the “robust” list of recommendations in the latest updated to DEP’s Climate Change Action Plan [to be finalized in the very near future]. The Council noted there is a real opportunity to employ consensus-building techniques to begin the process of implementing the recommendations in the Climate Action Plan. --State Resources Needed To Replace Pull Back Of Federal Government: Given the current federal administrative goal to minimize federal regulation of streams and wetlands, DEP is likely to be faced with increased responsibility for aquatic resource identification and assessment. The existing shortage of technical staff capabilities in the [DEP] regional offices will be exacerbated and require additional financial support as the U.S. Army Corps Of Engineers withdraws from making jurisdictional Determinations if aquatic resources in the Commonwealth are to be protected. -- State-Federal Issues-Chesapeake Bay, PFAS Other Water Obligations: The Council noted the challenges Pennsylvania faces in meeting its Chesapeake Bay Watershed cleanup obligations, warnings the Safe Drinking Water has received from the federal government on adequacy of its resources, recent proposals to reduce federal support for programs DEP administers for the federal government and on emerging issues like PFAS contamination. The Council encourages the Administration to assure open and candid community both inside DEP in raising potential federal compliance issues and in discussing possible alternative approaches that make sense for Pennsylvania and EPA. -- Environmental Remediation And Offsets: The Council pointed to the opportunities presented by environmental protection programs that require the mitigation and replacement of wetlands and other water-related functions and their potential to address the development of wetland, stream restoration and mine drainage treatment and reclamation projects that can help the Commonwealth met its general water quality restoration obligations. The Council discussed the opportunities private, third-party mitigation banks, in-lieu of mitigation fee programs and permittee responsible mitigation programs provide for not only effective restoration, but for simplifying permit processing. -- Preparing For An Evolving Energy Future: “Since the first Marcellus Shale Lateral Well came online in 2007, Pennsylvania’s energy capabilities have changed the energy markets in a drastic way for all Pennsylvanians. Coupled with an increase in ‘alternative’ fuels such as solar and wind power generation, the Commonwealth is now experiencing the cleanest air quality since the height of our industry revolution. “The move away from mainly coal and nuclear to natural gas has resulted in the most economical fuel source Pennsylvanians have ever experienced, down from the 2008 high of $13/MMBTU to less than $3/MMBTW, a decrease of 77 percent, enabling vast savings for households, manufacturers and consumers. “As the second most productive state in natural gas extraction, it would be foolish to ignore the economics and vast availability of natural gas and even more foolish not to encourage the upscaling of wind and solar sources of energy. “However, with climate change at the forefront worldwide, the demand for renewables will continue to rise. “The nuclear industry is also feeling the impacts of natural gas and may see further declines in the total shares of Pennsylvania fuel sources in the future. The nuclear industry, however, is working hard to ensure that they are not phased out quickly, as was the experience of coal-fired electrical plants. “All told, Pennsylvania, with its complex electrical grid, will continue to need all sources of energy as more homes and businesses demand additional power. It is important to understand that renewable energy is only about 10 percent of the total, with goals to make it higher. “In reality, renewables and the infrastructure needed to make it viable are quite a few years into the future. “For the long term, the Penn State Department of Architectural Engineering in September 2018, submitted a report to DEP titled, CHP-Enabled Renewable Energy Microgrids In Pennsylvania: A Guidance Document for Conceiving Feasible Systems. “The report stresses smaller energy system that use natural gas and renewables as opposed to the multi-billion dollar nuclear projects that have ben prevalent since the 1970’s. -- Sewage Facilities Planning: The Council recommended DEP examine its regulations to facilitate the use of well-tested and proven alternative technologies in the on-lot sewage planning phase of development and the effectiveness and direction of the entire Act 537 sewage facilities program. It also viewed this issue as a opportunity for consensus building. The House Appropriations Committee holds hearings on the DEP and DCNR budget request February 14. The Citizens Advisory Council is an independent 18-member advisory group appointed by the Senate President Pro Temporary, Speaker of the House and the Governor. The Council advises the Secretary, Governor and General Assembly about issues affecting all parts of DEP’s operation. The next meeting of the Council will be February 19 in Room 105 of the Rachel Carson Building in Harrisburg starting at 10:00. Click Here for more on the meeting agenda.